Chalet 6/9 places. Jacuzzi, sauna, fireplace, ideal location for hiking. 1740m above sea level in the hamlet Le Laus (common Cervières) in an exceptional circus, in the middle of pastures that will delight children and where the rural atmosphere will invite you to relax and stroll in company why not sheep, cows , marmots and chamois. On farms, you will be offered local products. Cottage in 18th century cottage completely renovated (110m2) Fireplace and sauna 4 places. SPA with overflow (Jacuzzi) 6 places. - In summer: hiking, lakes, fishing in lakes, cycling (mythical Izoard and Galibier Pass (Tour de France), botanical trail, climbing, via ferrata, mountaineering, mountain biking, paragliding, visit of several Maginot works, from the Cervières Museum. A little further, hydrospeed, canyoning, kayaking, adventure park with jumping and zip-lining, thermal-play center (thermal water pool) ... Glacier walks (the owner Patrice Choquer is a mountain guide he can advise you or (and) take you for hiking and other mountain activities (why not walk on the glacier, with a visit to the ice cave, descent into a crevasse ). Around and in Briançon, visit the old town dating from the Middle Ages, as well as many fortifications dating from Vauban. Two natural pools with clear and clear water. And even more hikes, on foot, on horseback, by bike. - In winter: the altitude at which the chalet is located ensures good snow conditions. The cottage sits on a vast area of ​​skiing 48 km of slopes. From the chalet, departure for many ski tours and snowshoeing, ranging from 500m to 1200m vertical drop, for beginners to more confirmed. Luge: in front of the chalet, at 50 m, toboggan run packed and secured. On the other hand, a long toboggan run is from the 9 km Izoard pass. The ski resort Briançon Serre-Chevalier valley is nearby for those who want to ski downhill (10 minutes). Bath with shower, sink, cupboards, a large mirror, hair dryer, washing machine. Do not hesitate to bring slippers and towels. Siamo stati una settimana con i bambini piccoli. Ci siamo trovati molto bene, lo chalet è molto bello e la sauna e la jacuzzi lo rendono spettacolare. Nous cherchions un petit coin douillet pour passer nos vacances un couple d'amis... Nous reviendrons !!! Le cadre est magnifique, le chalet est très spacieux et fort agréable. Nous faisons une bise à Patrice propriétaire des chalets !!! Ce chalet est est niché au coeur de la montagne, au calme. Les pièces sont très agréables et on s'y sent vraiment bien. Il y a plein d'activités aux alentours, été comme hiver. Je recommande vivement! Je n'ai qu'une envie : y retourner dès que possible ! Je n'ai jamais pratiqué le ski de fond dans un cadre aussi naturel. Les propriétaires sont super accueillants et m'ont donné plein de bons conseils pour m'aventurer dans la région. Quiétude, esprit ZEN et air pur au rendez-vous. Et le sauna : le TOP ! Très bon accueil, le chalet est super, on y est bien et les longue soirée d'hivers sont plus qu'agréable à vivre. je remonterai l'hiver prochain et resterai 2 semaines au lieu d'une seule. Très bel environnement, personnes très sympathiques, calme, paisable, proche de tout, beaucoup d'activités, idéal ! In the middle of the mountains, in a circus. Close to Briançon and Serre-Chevalier (8 Km). SUMMER: Sports and nature activities, hiking and walking, mountain lakes, fishing lakes and rivers, mountain biking and road cycling in summer. Hike on the prestigious Chenaillet geological site. Bright atmosphere and mostly sunny. WINTER: cross-country skiing and hiking, snowshoeing. Park of Eskimo dogs. A little further on, in Briançon, all that one can find in a pretty city of 11 000 inhabitants is there: two cinemas, a theater a aquatic center, well-being, fitness, trade, but also an old town crossed by its gargoyle, surrounded by its fortifications to visit too, famous for its impressive Asfeld Bridge. 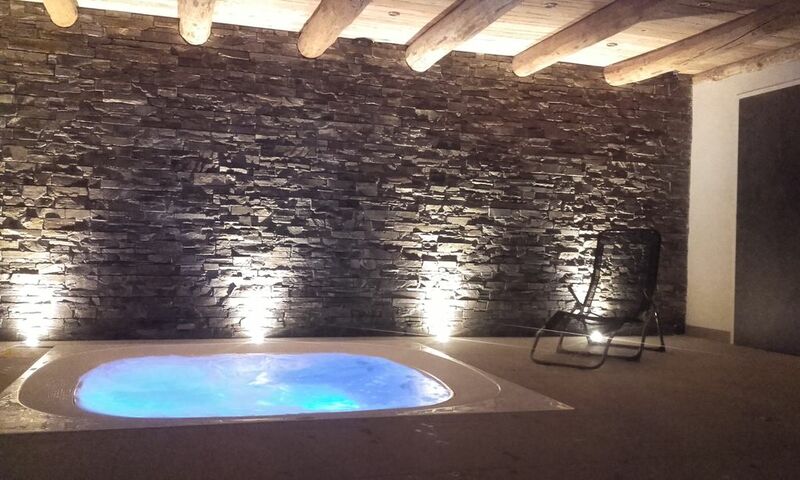 A few minutes from Briançon, the beautiful aquatic complex '' Les Bains de Monetiers '' is offered to you for relaxation and conviviality. Two completely natural pools in Villeneuve will enchant you with their clear waters. Aerial sports, outdoor activities, climbing, horse riding. Urban sports, extreme sports, white water, canyon. A whole circuit of hiking, horse riding, mountain biking, a kart circuit, and car on ice in winter, all kinds of white water activities will delight you. An adventure course. In another valley, the mines of Argentière will make you spend some amazing hours with a tourist guide. As for the mountain guide (the owner is GHM), he can take you to walk on glaciers, go hiking ice, visit ice caves, climbing, mountaineering, ski touring, of the icefall. We are on the edge of the Parc des Ecrins and near Queyras Park, on the legendary route of the Tour de France (Izoard Pass).